This photograph from Paul's collection was taken, as far as we can ascertain, around 1970, or perhaps just a little later, just before the existing three way junction between Wheelock Street, Chester Road and Nantwich Road disappeared to make way for the northern end of St Michael's Way which now sweeps away in a broad curve through the site of the buildings on the left, runs through what were once gardens and orchards and past the town centre, to join up with Kinderton Street at the Town Bridge. 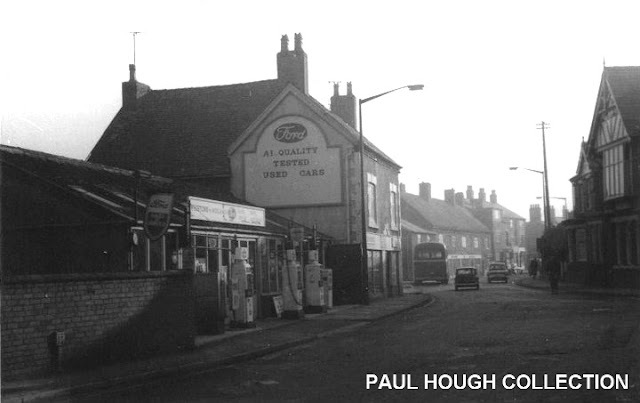 By this time Whiston's Garage had lost its memorable 'house-style', as seen here and taken on a corporate look, courtesy of the Ford Motor Co (still a dominating force in the district courtesy of Fords of Winsford, who even sponsor the local weather forecast on Granada TV)*. The brick wall on the left belongs to the Chester Road Methodist Church, which still exists as 'Church House' and houses a computer and stationery business standing on the corner of Chester Road and St Michael's Way. On the right can be seen part of the Victorian Red Lion pub (now an apartment block called 'Lion House') and to its left is the present day Acorn Surgery, a breakaway enterprise from Oaklands, the town's main doctors' surgery in St Ann's Walk. In 2014 preparations were being made for the practice to move from here to Lex House, adjacent to Middlewich Town Wharf. Ironically, this was the base for Middlewich's Doctors from 1967, after the Wheelock Street surgery down the road from here closed until the early 2000s when Oaklands in St Ann's Walk opened. This building had a former life in the 1950s, in very much the same line of business, as the Cheshire County Council Clinic where babies were taken to be measured and weighed and issued with National Dried Milk and orange juice. At that time the building, in common with all such NHS establishments of the period, reeked of a mixture of cigarette smoke, nappies and Dettol. * Diane Russell (see comments below) tells us that the 'Ford' in Fords of Winsford is nothing to do with the Ford Motor Co as seen on Whiston's old signage. A look at the FOW site does indeed reveal that there doesn't seem to be any connection. They could have chosen a less confusing name, but they're obviously doing well if they can afford to sponsor Granada's weather forecasts. Many thanks to Diane for the info - Ed. I really think they should have put St Michaels way behind the Whistons building keeping the old Wheeloch Street/Chester Road intact. But, rhey didn't and we live with the decisions made at that time. Had you noticed the absence of white lines along the middle of the road? I didn't think Fords of Winsford was part of the Ford Motor Co. That is Cliff Dickensons's of Winsford. Ah! So the 'Fords' in the name is just a coincidence? Never knew that. Thanks Diane!